Note: ZipHearing.com does not profit from reviews, and any links placed within this post (and all posts) are never affiliate links. Since so many people that struggle with hearing loss also find it difficult to hear the television, it’s no wonder an abundance of products exist to help you hear the TV better. Among these products, TV Ears is probably the most widely known and used, and is easily available in most towns at electronic stores like RadioShack, BestBuy, and sometimes even CVS/Rite Aid pharmacies. If you prefer to save a little money, there are hundreds of vendors online who sell the product for just above wholesale costs as well. So what are TV Ears? For starters, it’s a system that operates like a headset or headband, with plugs that go in the ears, which helps people hear the TV much better. This TV listening system actively clarifies and amplifies speech and dialog while lowering background noise so you can actually hear what’s going on. How exactly does it work? It’s actually a very simple setup and installation. Every TV Ears purchase comes with 2 things: A transmitter which plugs in to the back of the TV, and the TV Ear headset (which is worn). The transmitter acts like a streamer of sorts and sends the information from the TV, directly to your headset. This allows you to listen to your television without turning up the volume on the TV. This gives other people in the room the ability to watch TV with you while you listen at your own volume. How much does TV ears cost? If you were to purchase the analog headset (most popular) directly from the TV Ears website, the cost is $129.95. At Amazon and Ebay, you can find them for as low as $80, and at your local retailer, expect to pay around $140. So what are people saying about TV Ears? In general, there are very little complaints about the volume available, the sound quality, the user controls, and the balance of sound. Most people are very happy with how the TV Ears actually sound, and with the control they have over how things sound. As far as durability and comfort, there are some real questions. Many people report that their TV Ears do not last long, (usually a year), and then either physically break or malfunction in some way. In addition, many people have reported that the ear pieces are uncomfortable and will make the ears sore after an extended period of time. Do you have a problem hearing everything, and not just the TV? 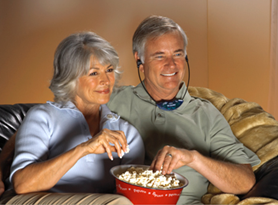 Before looking in to TV Ears, you might first want to try hearing aids. There are many hearing aids available today which can stream sound wirelessly from the TV (via a streamer) directly into your ears via the hearing aids. Several of these hearing aids are very discrete, comfortable, and have a sound quality that is at least equal to TV ears.